Pyrethrum (Tanacetum cinerariifolium) is produced for extraction of insecticidal compounds from the flower achenes. In 2004 and 2006, isolations from necrotic lesions on stems and leaves in three fields in northern Tasmania, Australia yielded four unidentified fungal isolates. Leaf lesions were medium brown and circular (2 to 4 mm in diameter) or irregular in shape (2 to 5 mm long). Stem lesions were irregular, necrotic spots, 5 to 15 mm below the flower peduncle, medium brown, 2 to 4 mm long, and 1 to 2 mm wide. Isolations were conducted on water agar following surface sterilization. Isolates were identified by colony characteristics and the presence of metabolite �eE�f (1). On oatmeal agar (OA), colonies had irregular margins, were greenish olivaceous-to-olivaceous gray with sparse, white, floccose, aerial mycelia. On malt extract agar (MEA), cultures were variable in color with olivaceous black centers with soft, dense, aerial mycelia. Conidia were hyaline, ellipsoidal to oblong, mainly aseptate, but occasionally 1-septate with dimensions ranging from 2.5 to 7.5 �~ 1.8 to 3.8 ƒÊm (length/width ratio = 1.7 to 2.1). All isolates had moderate reactions to the NaOH test for metabolite �eE�f. DNA was extracted from all four isolates with a DNeasy Plant Mini Kit (QIAGEN Inc., Valencia, CA). For identification, the internal transcribed spacer region (ITS1, 5.8s, and ITS2) and part of the translation elongation factor (TEF) region were amplified and sequenced. Primers ITS1 and ITS4 (2) were used for the ITS region and primers EFCF1 (5�Œ-AGTGCGGTGGTATCGACAAG) and EFCF6 (3�Œ-CATGTCACGGACGGCGAAAC) were used for the TEF. Amplicons were sequenced in both directions and consensus sequences assembled. The ITS sequence was 100% identical to Boeremia exigua var. exigua (GenBank Accession No. GU237715). Base pairs 413 to 1,214 of the TEF sequence from the pyrethrum isolates matched base pairs 1 to 802 (799 of 802 identities) of B. exigua var. exigua (GenBank Accession No. GU349080). All isolates were confirmed as B. exigua var. exigua using morphology and sequencing. Pathogenicity tests were conducted three times in separate glasshouse trials for two of the four isolates. For each isolate, conidial suspensions in water (3 ml/plant) from MEA, adjusted to 5 �~ 105/ml were applied with Tween 20 (1 drop per 100 ml of water) to 8-week-old pyrethrum plants (five pots per isolate with four plants per pot) using a hand-held spray bottle. Twenty plants were sprayed with water and Tween 20 as nontreated controls. Plants were covered with plastic bags for 48 h after inoculation and examined for symptoms after 15 days at 20�‹C. Disease incidence (number of symptomatic leaves affected per total number of leaves) of the inoculated plants varied from 7.5 to 9.4%. Noninoculated plants did not develop symptoms. Isolations resulted in cultures morphologically identical on MEA and OA to those inoculated. To our knowledge, this is the first report of B. exigua var. exigua causing disease in pyrethrum. Cultures were deposited in the New South Wales Department of Agriculture collection (DAR79101 to 79104) and TEF and ITS sequences for DAR79101 in GenBank (Accession Nos. JF925328 and JF925329, respectively). 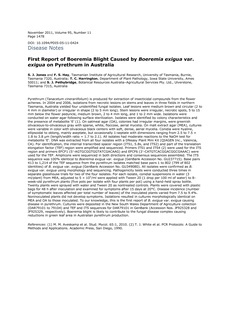 Boeremia blight is likely to contribute to the fungal disease complex causing reductions in green leaf area in Australian pyrethrum production.